The Copenhagen Wheel, a bolt-on, all-in-wheel solution was proposed a few years ago. It took them a while to get it to market. Borne of MIT engineers but inspired by the city that lives and breathes cycling, this elegant solution captured the minds of many and caused a lot of excitement. The motor, battery and sensors are all enclosed in the large rear hub, literally one simple bolt-on, powered wheel. 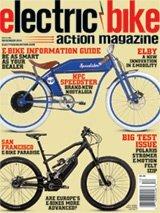 It’s a 350W motor that will turn your bike into a California Class 1 electric bike (20mph, no throttle). The 48V, 279 Wh Li-ion battery provides up to 30 miles (we assume on eco) and can recharge in 4 hours. The hub itself weighs in at 16.8 lbs, which is similar to the added weight of most hub motors/batteries, though most with external batteries will have much more capacity. This is still amazing to fit into the hub that just bolts on to an existing bike. See the exploded view of the wheel below. The claim is that the wheel simply bolts on and adds up to 10x the rider’s power. Cool features include full control via a smartphone app using Bluetooth Low Energy (4.0) that lets you set the power range from Turbo to works-against-you Exercise mode. The app can also be used as a key to enable or disable a rider’s bike, and provide diagnostic information. The goal is to make it a simple extension of the body. We think the bright red is both interesting and potentially good branding, though not so much if you’re trying not to draw attention to it. Superpedestrian is also offering a limited edition Wheel+ Bike, a stylish and minimalist bike that comes with the new Copenhagen Wheel already installed. They sell the Wheel for $1499 and the complete Bike + Wheel is $1999. Financing is available through Affirm starting at $95 per month for the Wheel and $135 a month for the Bike + Wheel with some caveats via a disclaimer on their site. Wheels are available as single-speed or with 7/8/9/10-gear Shimano/SRAM-compatible components. We’ve seen the Wheel at shows, but haven’t yet tried one. Hopefully we’ll have a chance to, soon. It’s an interesting idea. For more information, visit superpedestrian.com.